How can I check which of my apps are using most of my data? For a quick overview of your app usage, head to your Mobile usage and Wi-Fi usage timelines from the main menu. These pages will show you which apps are using your precious data, even when you thought they weren’t. 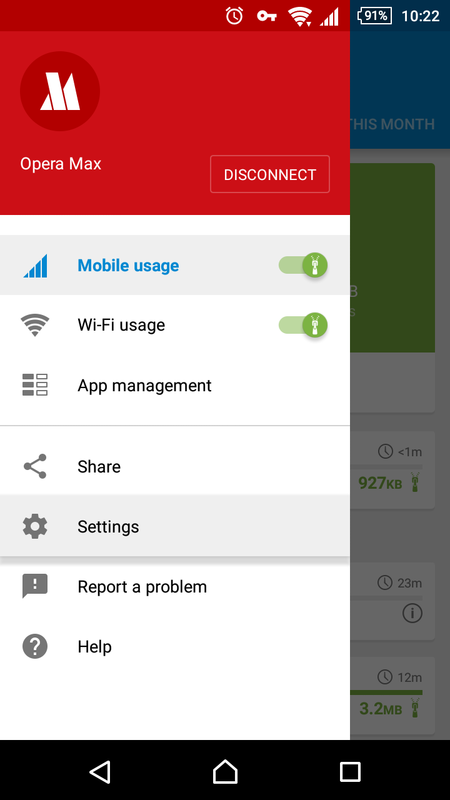 Tap a specific app on the timeline and Opera Max will show you a more in-depth breakdown of how that app is running on your device. This will help you decide which apps you trust to keep running and which apps need to be restricted, so you can get even more out of your data plan. How can I stop apps from consuming data when I’m not using them? On your App management page, you can block apps with a quick tap. This will stop them sneaking up on you and guzzling that data! 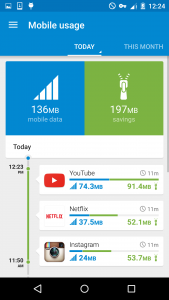 How can I find out which apps will get the most data savings from Opera Max? 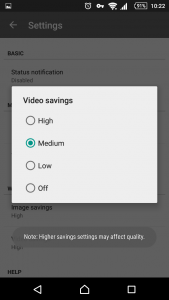 On the Savings section of your App management settings, you can see a quick breakdown of how much savings you are getting from each of your apps. 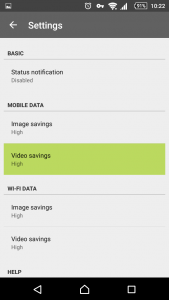 Opera Max saves data on text, images and videos transferred over normal web connections. Opera Max cannot compress binary or encrypted data, for example app installations or updates through Google Play or traffic on your bank or email applications. But, if you use other apps like WhatsApp or Instagram, you’ll start to see savings. How can I get data savings from apps like Facebook that use encrypted connections? 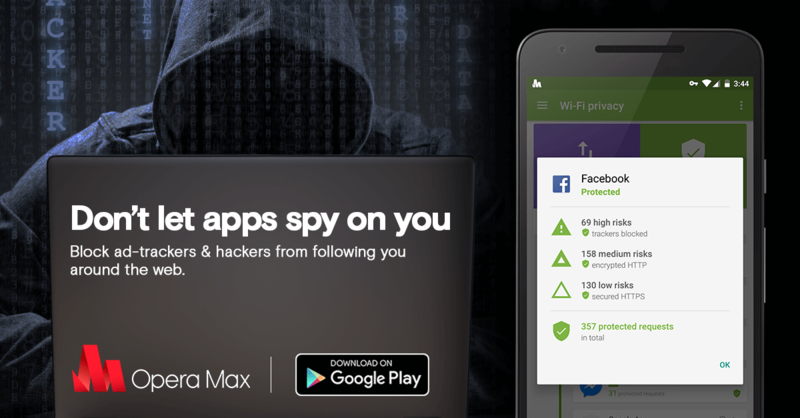 Apps such as Facebook use encrypted data, which means Opera Max cannot compress their traffic loads like other apps. 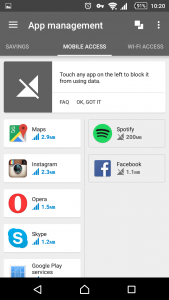 However, you can still use Opera Max to manage when you want to allow these apps to use data. And, that means you can still see a lot of savings. For example, you can set Opera Max to only allow Facebook to use data when you are on a Wi-Fi. How can I make sure video quality and buffering time isn’t affected? 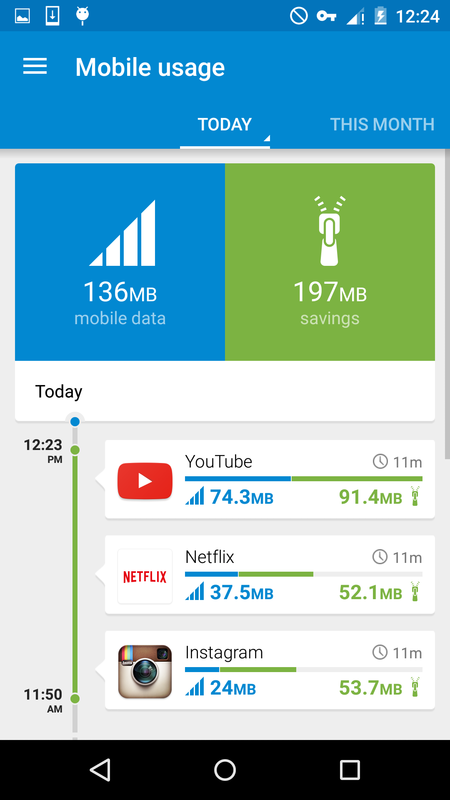 Opera Max has been designed to optimize video playback and save data without affecting quality or loading time. However, in some cases you may find that having high video-savings can bring some buffering. 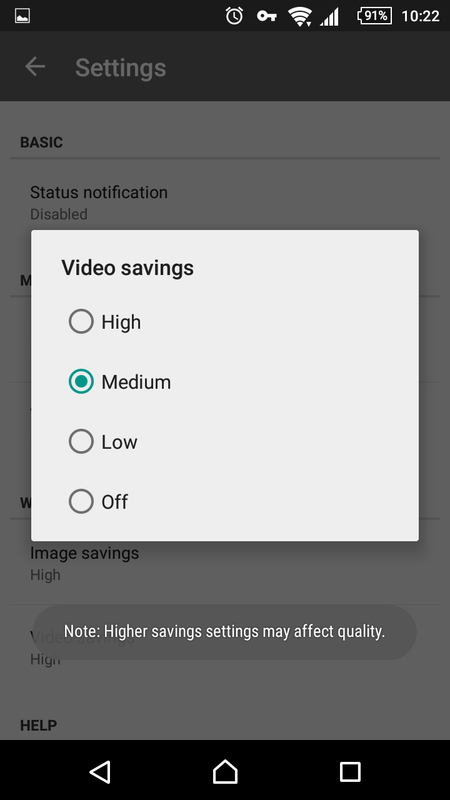 To change this, go to Settings > Video savings and toggle the setting from High to Medium as this may suit your device, network and video player better (don’t worry, you’ll still be getting great savings!). How can I get better battery life using Opera Max? 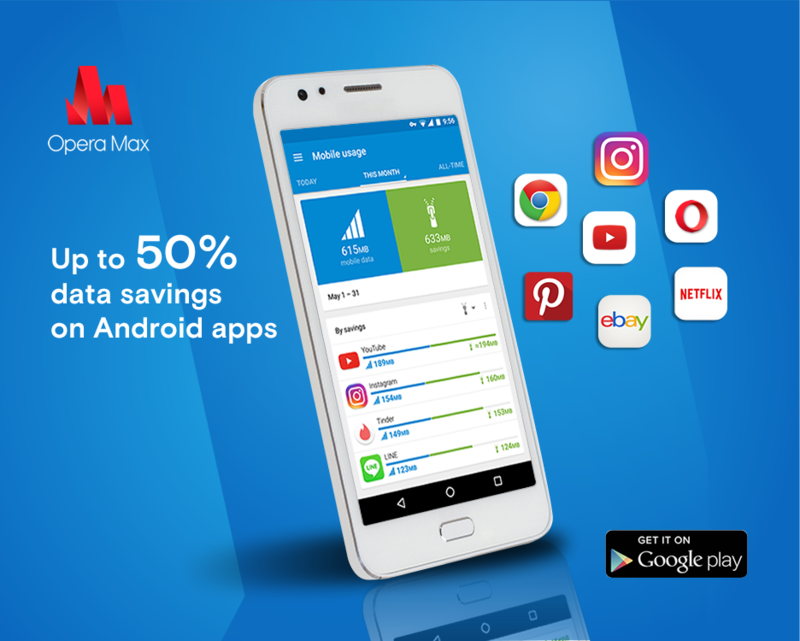 By using Opera Max’s app-management features – such as blocking your other apps from sneakily sapping battery – you can reduce your overall battery consumption. 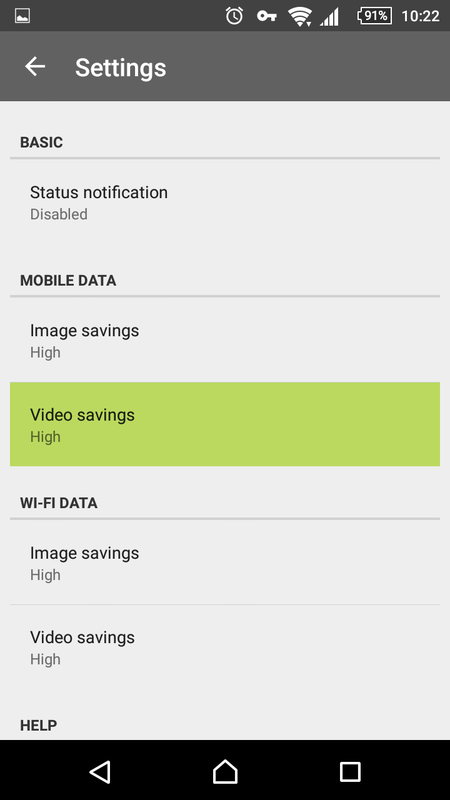 Also, when watching videos, you will actually reduce your battery usage slightly with Opera Max enabled (our tests show about a 5% gain). This is because the CPU uses a lot less power than data transmission processes, so high-traffic savings positively effect battery usage. When you check your battery use on your device, it may show that Opera Max is using a good chunk of it…don’t panic! What you are actually seeing here is the total amount of use from all your apps now running through Opera Max (and now appearing under that name). How come Android OS shows that Opera Max is using lots of my data? Oops! Silly Android! Like with battery usage, what you are seeing is all your data usage from all the apps now running through the Opera Max VPN. Your Android device cannot separate them out anymore so the device shows all your data use under the Opera Max name. Opera Max itself does not need much data to work its magic – something like 2 MB a month! For more answers to your questions, have a look at our Opera Max FAQ, or if you have a bug to report you can tap Report a problem in the Opera Max’s main menu and we’ll be sure to investigate it for you. And don’t forget to come say “hi” on Twitter and Facebook.